A Certain Becca Nails: My First Watermarble! Hello! Today I have a very exciting post - my first watermarble! I'd consider this my first official attempt at watermarbling, so be kind! I did try it out a few weeks ago, but I wasn't brave enough to actually dip my nails in. 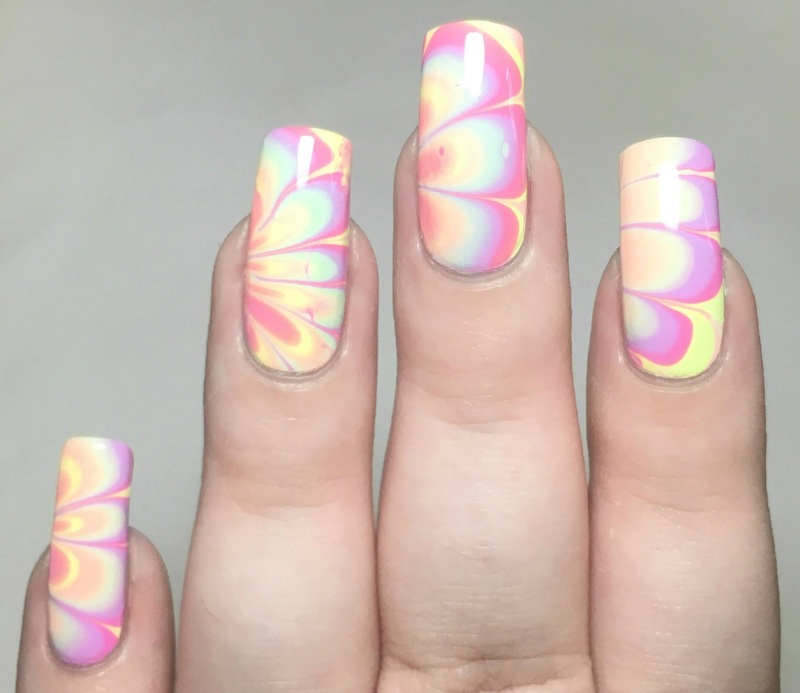 This time round reviewing for Born Pretty Store I asked for a watermarble tool. I then had no choice but to dip, and dip I did! Read on to find out more! First, here's a look at the watermarble tool I recieved from Born Pretty (item #38980, online here). It is very similar to the size and shape of a pen. When playing previously, I found it hard to create a neat pattern in the water. This fixed my issue. It drags the polish nicely without too much pressure, avoiding any holes. 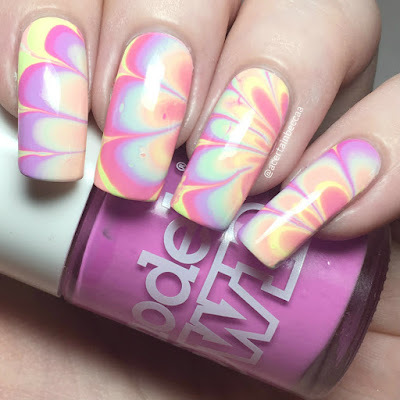 For the watermarble itself, I used the entire Models Own Soft Pops Collection. I had heard that these were really easy to use - and they are! They spread out well into even rings and don't dry too quickly in the water. I painted a white base, applied liquid latex, then dipped all of my nails one by one. I didn't latex quite high enough on my fingers, so that's definitely something I've learnt for next time! After peeling it off and a quick bit of clean up, I finished with topcoat. Frustratingly, I used my thumb as a tester nail and it came out better than all my others. I couldn't publish this without sneaking a picture of that nail in, so here it is. What do you think? I am super excited to share this, I love it! It may not be quite perfect, but I'm very proud considering it was my first proper try. I was also a bit worried that if I redid a nail to make them all match better, that I would mess it up. If anyone has any watermarble tips or tricks, I'd love to hear them!